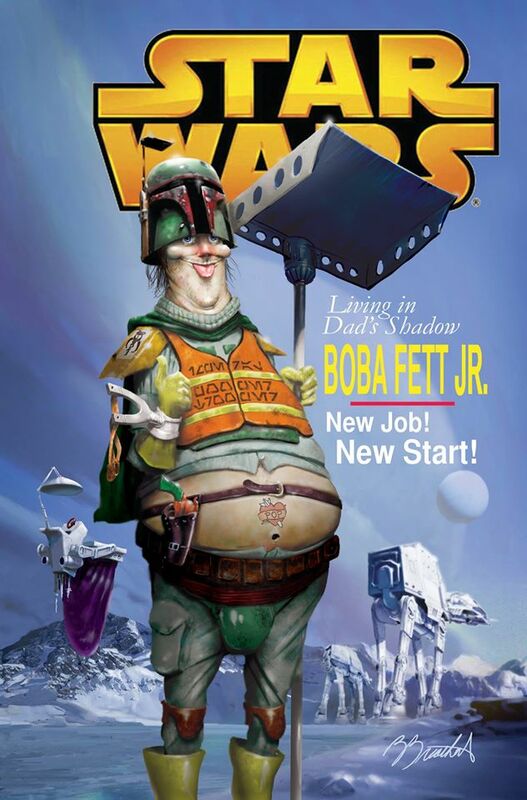 You are at:Home»Artwork»Berkeley Breathed’s Rejected Star Wars Comic Cover Features Boba Fett Jr. Recently, the publisher of the Star Wars comic books requested a special “funny” promotional cover in honor of the coming movie. I cooly explained that LucasFilm would never, ever find anything I concocted funny. The comics guys found this idea absurd, nay, impossible — a sweet gentle thought. Below is the instantly-rejected cover art, lovingly referred to in legend as the “Pooper Scooper Trooper” edition… the fastest rejection in licensed comic book history. Ironic frosting: A producer for 1991’s Opus CBS TV Christmas special “A Wish For Wings That Work” was a smart, charming young executive named Kathleen Kennedy. She now runs Lucasfilm Ltd. Opus forgives you, old friend. Just bring us a good story, please. I guess the drawing is implying that AT-ATs take massive robo-dumps. I don’t see how this is any more off-color than Robot Chicken, or Star Wars Detours, or Family Guy, or any number of other spoofs Lucasfilm is okay with. I’d certainly read a whole comic about Boba Fett Jr.